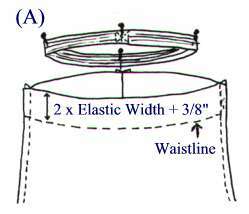 The self band elastic waistband can only be made when the garment has not been dart-fitted at the waistline. Cut the garment with an extension above the waistline (A) that is twice the width of the elastic plus 3/8″. Mark the waistline with a basting thread. cut a length of elastic to fit snugly around the waist plus 1/2″. A. 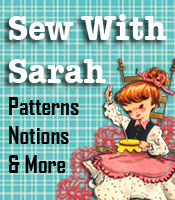 Edge stitch, overlock or press the upper edge of the waist area. Fold the casing at the fold line to the inside of the garment. B. Stitch the waistband casing down at the original basted waistline, leaving about 2″ now sewn at one side seam. C. To insert the elastic, attach a safety pin at one end of the elastic and tunnel the elastic through the casing starting at the unsewn casing area and pushing the closed safety pin/elastic thrugh the casing. Push the pin/elastic around through the casing to the same opening, being careful to keep the other end of the elastic outside of the casing. D. Overlap the elastic ends and machine stitch the ends securely. Evenly space the waistline fullness (E) and stitch through each seam allowance at the casing to stop the elastic from twisting later when worn or washed. Then stitch the opening closed. This information is an excerpt from the Basic Clothing Construction book. The book is filled with all the information you’ll need for putting garments together.